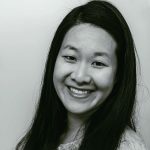 Published Dec 3, 2017 By Julia 72 CommentsThis post may contain affiliate links. 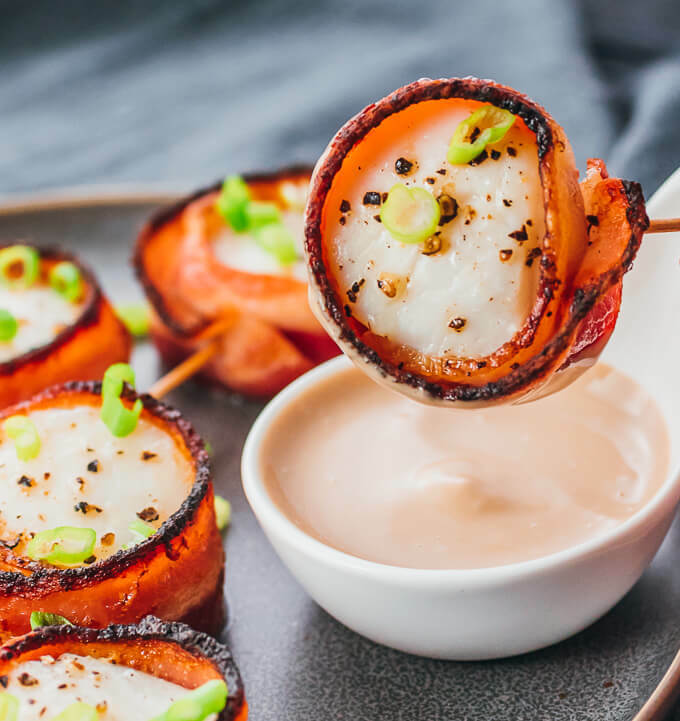 Here’s a fancy appetizer for your holiday parties: scallops wrapped in bacon, broiled in the oven, and served with a tasty balsamic mayo sauce. 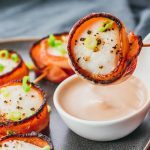 These bacon wrapped scallops are a delicious appetizer that could be used for any gathering, including the upcoming holidays at the end of the year. 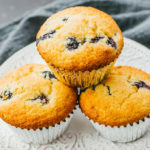 Since they’re grab-and-go, they are easily enjoyed as quick bite-sized party passers. I don’t buy scallops often, so when I do they’re usually a rare treat for special occasions. These scallops are broiled until tender and are complemented by the crispy bacon wrapping, plus a drizzle of lemon juice for a fresh taste. The accompanying sauce is a simple balsamic vinegar and mayonnaise dip, imparting a touch of tangy sweetness to every bite. 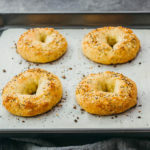 With only a handful of ingredients, the recipe is very easy to follow and only takes about 30 minutes total for prepping and cooking. I used Thick Cut Hardwood Smoked Bacon from Hatfield — they’re a family owned company that supports American family farmers who ethically raise their animals with no hormones or steroids added. They have a strong commitment to sustainability, and you can use their product locator to find locations that sell their pork products. If you use a thinner cut of bacon, make sure that you don’t overcook the bacon when frying; it needs to be soft and pliable enough for wrapping. You can enlist the help of kids or other family members to help you wrap each scallop with a bacon slice and securing with a toothpick. 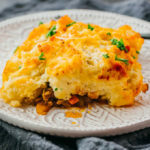 If you make this appetizer for the holidays, you’ll likely have plenty of people around to take a role in creating this dish. Depending on the size of your scallops, you may want to use scissors to trim the width of the bacon slices so that they can easily wrap around the scallop without protruding. I use an oven-safe rack fitted over a lined baking sheet while broiling these bacon wrapped scallops. This allows the bacon grease, lemon juice, and other liquids to fall through without forming a puddle beneath each scallop. It also helps cook the bacon and scallops more evenly. This recipe calls for broiling, which is my preference, resulting in crisper bacon and tender scallops. An alternate option is to bake at 400 F for 10 to 15 minutes until the scallops are cooked through. It doesn’t take very long to cook scallops, as they cook quickly under high heat and are done at about 130 F. Their flesh should be firm, and the color should be white and opaque. These bacon wrapped scallops pair nicely with the balsamic mayonnaise sauce, which is a bit tangy and a bit sweet. I often use this sauce for savory bite-sized appetizers, including globe artichokes and bacon wrapped brussels sprouts. For another delicious bacon wrapped appetizer, check out these bacon wrapped jalapeno peppers. A fancy seafood appetizer that's easy to make and served with a tangy balsamic sauce. Arrange bacon slices in a single layer on a large pan, working in batches if the pan isn’t large enough to hold all at once. Cook over medium heat until the bacon is browning but still soft and pliable for wrapping, 5 to 10 minutes after the bacon starts to sizzle. Transfer the bacon to a paper towel to drain and cool. Prepare 6 toothpicks and an oven-safe rack on top of a baking sheet. Use paper towels to pat the scallops dry. 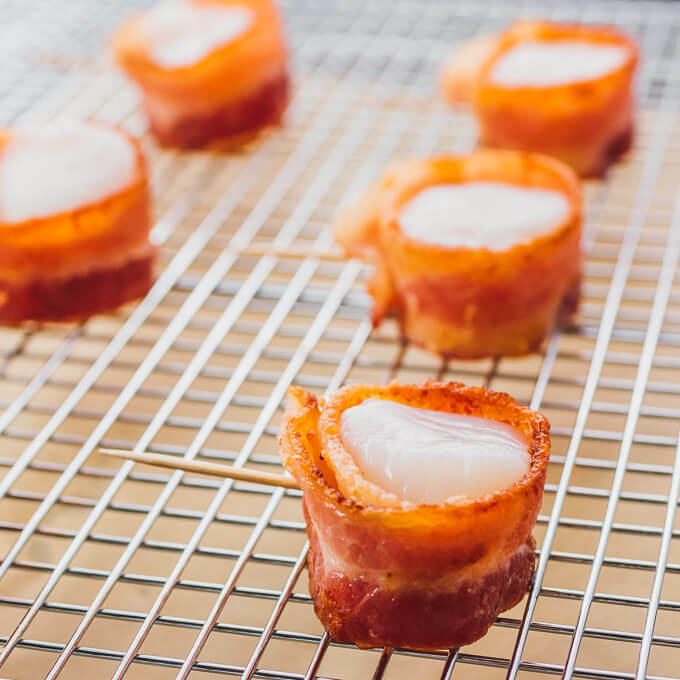 Wrap each scallop with one bacon slice, securing with a toothpick. Place the wrapped scallops on the baking sheet. If the width of the bacon slices is much larger than the scallops, trim with scissors for a better fit. Brush the top of each wrapped scallop with bacon drippings from the pan. Sprinkle black pepper. Lastly, drizzle lemon juice on top. Set the broiler on high, broiling until the scallops are cooked through, about 10 minutes. Optionally, flip the scallops to crisp up the bacon on the other side, about 5 minutes. While the scallops are broiling, combine both sauce ingredients in a small mixing bowl, stirring until smooth. Top the bacon wrapped scallops with sliced scallions, and serve with the balsamic mayo sauce for dipping. 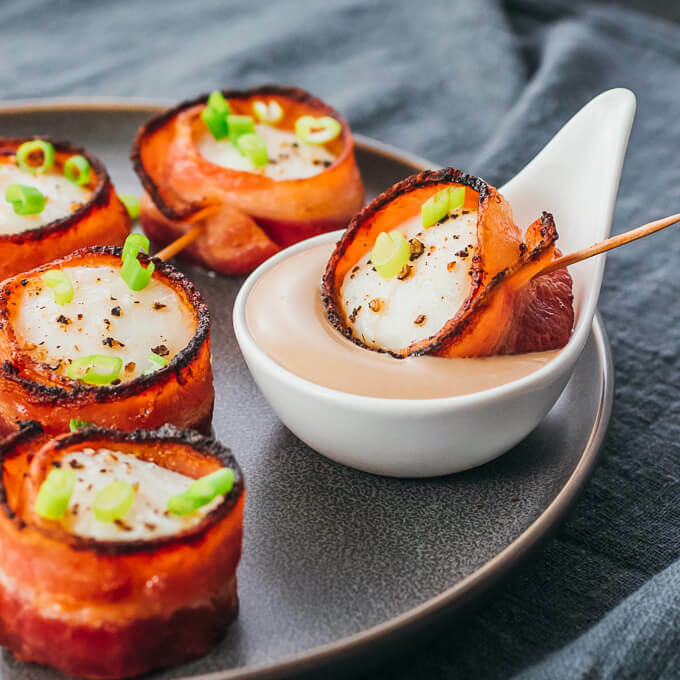 This recipe yields 1.5 g net carbs per serving (1 bacon wrapped scallop). Bacon wrapped Dates are my favorite to make! Thank you for the chance to win! My favorite bacon recipe to make for the holidays is a nice breakfast with Bacon and Eggs with Toast, and a lot of Crushed Pepper. For the holidays I love to make Bacon-Tomato Crostini and Bacon-Crab Dip! 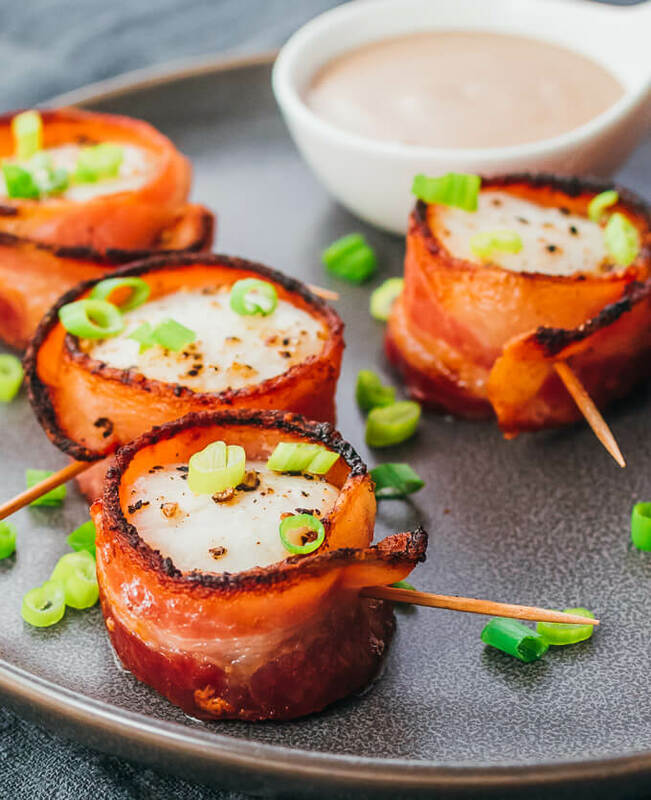 I would love to try these bacon wrapped scallops! I haven’t tried these yet but I would like to make some Hatfield bacon wrapped holiday appetizers maybe some bacon wrapped shrimp!